In an effort to curve my hard rock/metal listening ways, my Mom bought 2 albums for me on Christmas. She was never too keen on metal and wanted to try and sway me to listen to something else. As I am unwrapping gifts, I got to the records, both of them wrapped together. I knew they were albums before I unwrapped them but had no idea as to which ones they were. On top was Regatta de Blanc by The Police. 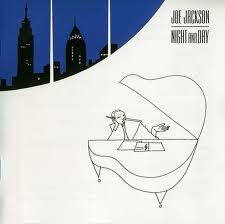 Behind it was Joe Jackson’s Night and Day. To say I was disappointed would have been the understatement of the century. It was like the kid in Christmas Story not getting his BB gun. I was hoping to get something like a KISS, Black Sabbath or Judas Priest album (wishful thinking, I know). So I basically said, “Oh. Cool. Thanks.” and went on to play with my Stomper trucks or something. haha. Shortly thereafter, though, I did put the records on to at least give them a shot. I was already familiar with the Police so that was nothing new and I did fall in love with that album by them. But the Joe Jackson was something completely different. I listened to it a lot and still do. It’s a pretty interesting album in many ways. One, the only guitar used on the album was a bass. No 6-string whatsoever anywhere. The album is very well-written and performed. Joe has a way of lyrical phrasing that really works with his music. The album has sort of a NYC punk feel to it without sounding punk at all. It’s hard to explain. I love this album and always will. I never delved into his other works although I am familiar with some of his other “hits” thanks to Anthrax or the radio. The album seems to be sort of a concept album about life in New York City in the early 80s and touches on the gay culture a bit. It’s a fine record overall and anytime I listen to it, it’s front to back, nothing skipped. So, thanks Mom. While you didn’t get me out of hard rock/metal, you did open my ears a little bit to some other stuff.